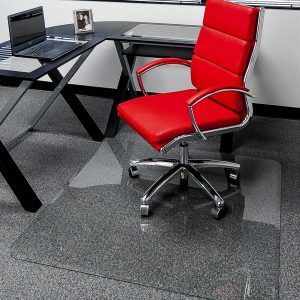 Why is this revolutionary, patented glass chairmat a must for your offices? Clear, beveled,quality elegance – complements office furnishings. Never needs replacing, saves money. Carpet and hardwood stay new and never wear under glass chairmats. 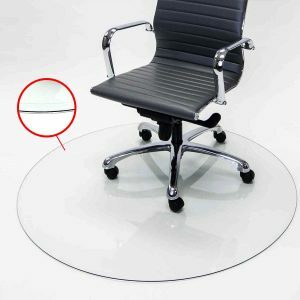 Desk chairs glide, no more pushing or tugging on thin vinyl mats. Made from silica sand and recycled glass, not a petroleum product. A beautiful lasting piece of office furniture. This is not an office supply item you buy, can wear out and throw away. For more information on clearly Innovative glass chairmats, take a look at our frequently asked questions. Right away I noticed a change, literally as soon as I sat in my chair. I felt like I had better posture and after a few hours, my low back didn’t feel as strained as before… Thank you so much for offering this product. It is easily one of the most worthwhile purchases I have made. I have been using my new glass chairmat for a few weeks and am very pleased with it! I suspect that it will outlast many plastic chairmats that I will never need to buy again. There are two more desks that I may be looking to upgrade to glass chairmats when I return north later this year for the summer months. Thank you for making this product available at an affordable price! Yes, we love our purchase and your company provides a great item compared with the 4 plastic mats that I have worn out over the years. I highly recommend this product and your company. You are on the right track from shipping and packaging the mat like Fort Knox. I purchased the Executive mat for my home. It has survived a (moving) trip half way across the country, and some shorter moves since then. But now it has survived a house fire! While searching for anything that survived, I felt the edge of the mat. After removing the debris and plaster, I was able to lift and lean it against my desk. Thank you for your ingenuity. © Copyright 2013- Clearly Innovative. All Rights Reserved.